We have many guests who start the weekend early and for them, we now offer our brunch menu from 11 a.m. to 3 p.m. every Friday, Saturday and Sunday. Brunch items change quarterly – unless we tweak an item or have supply issues. 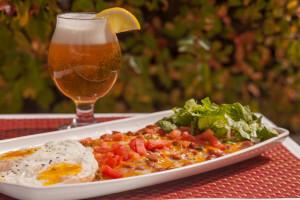 Huevos Rancheros is always offered – but it’s sauce changes. We have won local awards for our Bloody Marys that are served with a snit of dam beer. Check out the current Brunch Menu.